Woo hoo! Its Finally Here! After I took our old core stability book off the market almost 18 months ago, we have had so many dancers and teachers patiently waiting for the new version to be released, and now it’s finally ready! 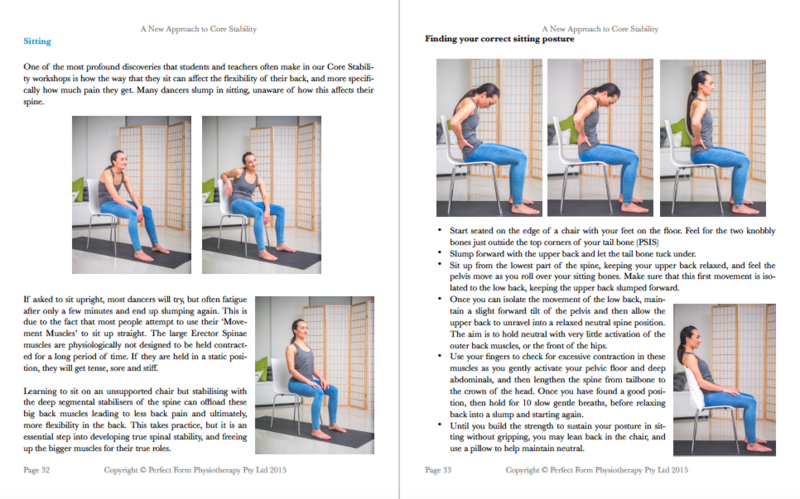 I wanted to review the resource as so much has changed in the research and development of training stability of our spine, and I always want every one of our resources to be sharing the latest knowledge available. So while the old one was good, this one is even better. By far one of the major problem areas that we see as therapists working with dancers, athletes, office workers and weekend warriors alike is in the the area of “Core Stability.” The issues we see are two-fold. On one hand, very few people have good natural core control and dynamic stability of the spine. The second is that many of the exercises that people are taught to do do not address the real issue. Lack of true stability of the spine leads to over compensation by other structures which leads to many of the injuries that we see in the clinic. This is especially true for young dancers who are training specific movements over and over again. Are you still doing traditional stability exercises? The latest research shows this could be doing more harm than good! Many dancers, athletes and other individuals who have been involved in Personal Training, Physio or Pilates classes are performing “core” exercises that may focus too much on control or restricting movement by bracing. Often we discover that the very exercises that individuals are using to try and better themselves are actually part of the problem. Over recruitment of muscles can cause just as many, if not more issues, than weakness in muscles, and this often happens when individuals have been formally taught how to move. In addition, many people perform their stability exercises lying on their back, which does not prepare them for the demands of sitting, standing and dancing! The focus in training core stability has evolved from a focus on control, maintaining neutral and restricting movement, to tapping into the natural deep stabilising systems of the human body, and reprogramming them to allow a fluidly stable, dynamic core. This allows greater relaxation of the outer movement muscles, relieving much of the pain experienced by dancers and office workers alike. Using a combination of exercises to naturally facilitate the subtle deep core muscles, and a clearly laid out grid to help guide your training through 5 different positions and 5 different grades, our “New Approach To Core Stability” program will teach you how to have a dynamically stable spine throughout your life, no matter what you do during the day. This kind of stability is essential for resolving chronic back pain, but also has the added benefits of allowing greater spinal mobility and flexibility through the whole body, as many muscles that have been previously overused can relax. This program approaches Core Stability training in a completely new way. Using a simple visual chart comprising of 5 different positions(Lying, Side Lying, 4 Point, Sitting and Standing) and 5 different grades, you can work your way through the entire program at your own pace, layering levels of stability to achieve ultimate dynamic control of the spine and pelvis. We work on rediscovering the body’s own intelligence, and rebuilding the natural layers of stability that many of us fail to build as infants and young children. This logical and strategic process allows you to develop your own individual training program within the framework of a structured course, and will also give you unlimited options for variations, once you understand the principles. Take the next step in your own professional and personal development, and share the jewels that I have discovered in this area of training! the purchase price until 30th September 2015! Remember that all our prices are in Australian Dollars – so go to www.xe.com to work out how much in your local currency! This is a completely new program, which will change how you feel about “Core Stability” forever! I am the Owner and Director of Perfect Form Physiotherapy and The Ballet Blog, two businesses aimed at educating, healing and empowering dancers through two different channels. PFP aims to provide the highest quality of healthcare to dancers, in a nurturing environment, while The Ballet Blog provides an online knowledge base and resources that help dancers heal themselves. I discovered a love of dance, and of helping others heal, at a very early age and started massaging my family at just 8 years old. Although I never became a professional ballerina, my future was set when I discovered Physiotherapy for dancers. In the past decade, I have built a worldwide following and a large collection of books, DVDs and websites, along with two physio clinics in Sydney, Australia, all based on education to prevent injury and maximising performance rather than waiting for injury to occur. My strong history in classical dance has made me internationally respected among young and professional dancers, their parents and dance teachers. I am committed to using my knowledge and experience to bring attention to the changes that the dance industry needs to make by developing programs to educate and inspire young dancers. At the 2007 IADMS conference, my pre-pointe assessment was joint-winner of the award for making “The Greatest Contribution to Dance Medicine.” Resources such as The Perfect Pointe Book, Front Splits Fast and the Will I Ever Dance Again? programs combine my practices into inspiring educational resources to create change on both individual and industry levels. Ooops! You don’t have access to this content!